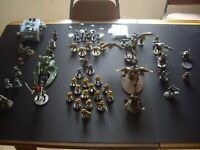 Warhammer 40k Tyranids Army Part Painted Games Workshop Tyranid Models !!! Warhammer 40k Massive Tyranids Army Part Painted Games Workshop Tyranid Models ! Warhammer Age Of Sigmar Idoneth Deepkin Army Akhelion Guard Games Workshop !!! Immediate payment of C $49.99 is required.